Every Christmas our family has Prime Rib for dinner. 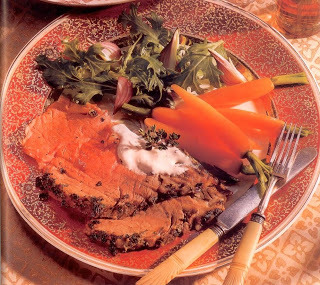 Years ago I found a recipe for prime rib with an herb rub and a home made horseradish sauce, and it’s delicious. Our family look forward to it every year. Enjoy! Mix all ingredients together. Cover and refrigerate at least 1 hour to blend flavors.This recipe, and 349 others can be found in our cookbook “Rocky Mountain Lodge & Cabins Favorite Recipes” which can be purchased in our Gift Shop. Click Here to order your copy.